On Feb. 23 the North Dakota Highway Patrol launched a military-style assault on Oceti Oyate (“The People’s Camp”). The police stormed the camp, raiding tipis with guns drawn, pointing them at people in prayer. In the rush to escape the raiders, 17-year-old Fallon, an Oglala Lakota from Wounded Knee, S.D., was caught in an explosion and seriously burned. Women at the March on Washington on Jan. 21 oppose the Pilgrim Pipeline in New York and New Jersey. Photo by NY-NJ Coalition Against Pilgrim Pipeline, facebook.com/StopPilgrimPipeline. Meanwhile, Bureau of Indian Affairs police and federal park rangers raided the Rosebud camp on tribal land. (The Oceti Oyate camp was on land belonging to the tribe by treaty but the government refuses to recognize it.) Both camps were destroyed, with 46 people arrested for “trespassing,” including some journalists, medics, and military veterans who came to shield water protectors from police attacks with their bodies. North Dakota Gov. Doug Burgum hypocritically cited environmental “concerns” should the camps’ structures be washed into the Missouri River by spring floods. He did not mention the far greater damage a massive oil spill could cause, though the water protectors have repeatedly warned of it. “Mni Wiconi” (water is life) is the cry of Standing Rock supporters worldwide. Burgum also managed to sign four laws clamping down on protesters on the very day of the assault. The state, the Army Corps of Engineers and the Standing Rock Tribal Council have made clear that they want to eliminate the other resistance camps that still remain in the area. The Standing Rock reservation, where Sitting Bull was killed in 1890 by federal police aiming to decapitate the Ghost Dance movement, today has rates of poverty (41%) and unemployment (24%) far higher than the country as a whole, and poor schools, housing and healthcare. American Indians also have the highest rate of being killed by police. In the waning days of the Obama administration, the Army Corps had finally conceded the need for a full environmental impact statement before the pipeline work under the Missouri River could be allowed, as required by federal law. That changed after Trump issued orders to force through the Dakota Access and Keystone XL pipelines. The Corps cleared the way for the raids by suddenly deciding no environmental impact statement was needed. The movement has won significant victories, from moral support and on-site solidarity by members of hundreds of Indigenous peoples in the U.S. and elsewhere, to boycotts of the pipeline’s banks and divestment from them by 500 organizations and a few cities like Seattle. 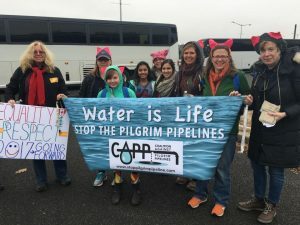 Resistance at other pipelines has flourished, including camps opposing the Pilgrim pipeline in New Jersey, the Trans-Pecos in Texas, Atlantic Sunrise in Pennsylvania, Sabal Trail in Florida. The struggle continues around the Bayou Bridge pipeline in Louisiana. On Martin Luther King Jr. Day, 12 people were arrested blockading the Valero refinery in Memphis, Tenn., in protest of the Diamond Pipeline proposed to run there from Oklahoma. The Bad River Band of Lake Superior Chippewa in Wisconsin voted to remove the Enbridge Line 5 pipeline from their reservation. International struggles abound, like the Unist’ot’en resistance camp in British Columbia that has blocked pipelines from their territory since 2012. On March 7-10, there will be a Native Nations March and Camp in D.C. in solidarity with Indigenous peoples across the world. The powers that be want to crush this movement, but their violence is backfiring. This entry was posted in Articles and tagged Atlantic Sunrise, Bad River Band, Bayou Bridge pipeline, Bureau of Indian Affairs, climate change, Dakota Access oil pipeline, Diamond Pipeline, Doug Burgum, Enbridge, Franklin Dmitryev, global warming, Indigenous peoples, Lake Superior Chippewa, Memphis Valero refinery, Mni Wiconi, Native Americans, North Dakota, Oceti Oyate, oil, Pilgrim pipeline, Rosebud camp, Sabal Trail, Standing Rock, Standing Rock Tribal Council. Bookmark the permalink. ← Editorial: Yemen as world’s future?